A 20-minute quickstart to get a good sense of what MapFish is and what MapFish provides. Follow the instructions of the installation page and come back here once done. Make sure the virtual Python environment is activated before you proceed with the next section. Here you’re going to use the framework to create your first MapFish application. MapFishApp is the name of the MapFish application you’re creating, you can pick any name of your choice. We’ll assume that you choose MapFishApp in the rest of this quickstart. When asked what template engine to use answer mako, which is the default. When asked if SQLAlchemy 0.6 configuration is to be included, answer True, as your MapFish application will include web services relying on database tables. You should now have a folder named MapFishApp. This folder contains your application files. This command starts your application in the Paster web server, which is a pure-Python web server commonly used during development. 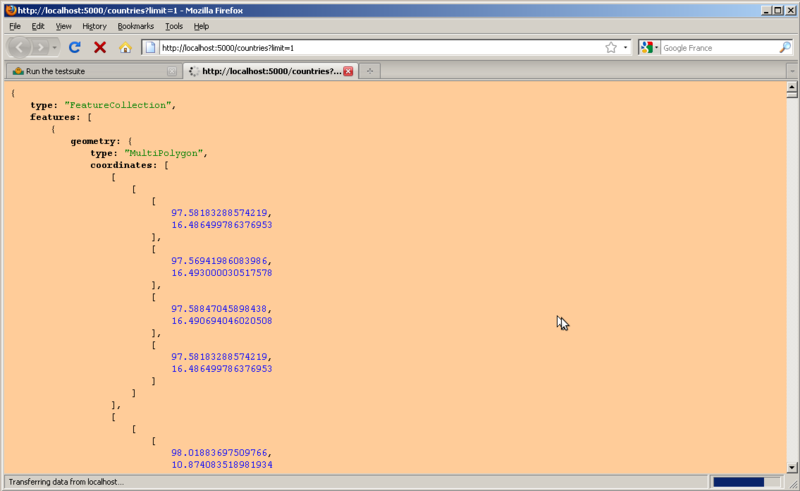 You can list the content of env/lib/python2.5/site-packages to know what version of mapfish.plugin.client is in use. When asked whether to overwrite index.html answer y. This will overwrite the index.html page you saw in the last section by the one provided by the mapfish_client template. When asked whether to overwrite favicon.png also answer y. Note the use of the --reload switch. This switch makes the Paste server monitor all Python modules used by the MapFishApp application and reload itself automatically if any of them is modified or if new modules are created. This is especially useful during development. This default user interface is composed of: a map, a toolbar above the map with tools acting on the map, and a layer tree for controlling the visibility of layers. The map itself is composed of two OpenStreetMap layers. The default user interface is provided to the application developer as an example. The application developer is free to build on it, or delete it to write his own if he wants. MapFish provides a command for generating web services implementing the MapFish Protocol. A MapFish web service relies on geographic database table. In this tutorial PostgreSQL/PostGIS is used as database, but you can also use other database systems, see Using spatial databases with MapFish for further information. Before creating web services you need to set up the connection to the geographic database. For this quickstart an existing public database will be used, but you can also set up your own database (see Using spatial databases with MapFish). In real-life scenarios, the database system and the MapFish application execute on the same host or on hosts of the same private network. The connection string specifies that the postgresql driver must be used, the database system is located at www.mapfish.org on port 5432, and the name of the database is quickstart. singular provides a singular name for the layer. plural provides a plural name for the layer. Both are used by the code generator when substituting variables. table provides the name of the database. epsg provides the coordinate system of the table data. geomcolumn provides the name of the geometry column and geomtype the geometry type. Further information about the layer.ini configuration can be found in the framework documentation. Watch the indentation! 4 spaces are needed here. Now that the countries web service works, let’s create a search functionality based on that web service. This search functionality will involve displaying a popup containing information about the country that is clicked by the user. 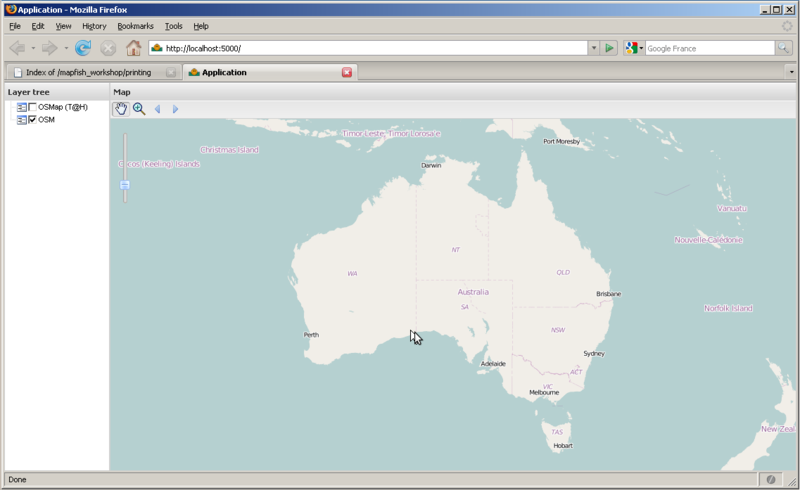 In the above code a GeoExt.Action configured with an OpenLayers.Control.GetFeature is added to the array of actions. The OpenLayers.Control.GetFeature object is connected to the countries web service through an OpenLayers.Protocol.HTTP object. 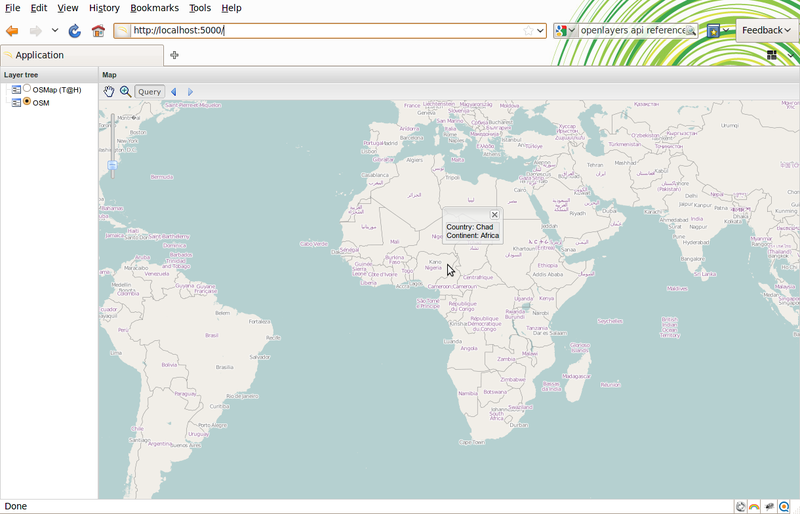 In this example a GeoExt.Popup containing the name of the clicked country, and the name of the continent, is displayed.